State Representative Bill Simanski proudly represents the 62nd General Assembly District covering Barkhamsted, Granby, Hartland and New Hartford. He was re-elected to his fifth term in November of 2018. 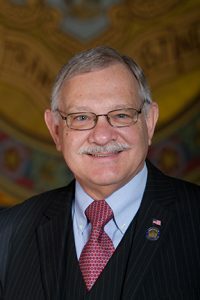 Bill has been appointed as an Assistant Republican Leader and is a member of the Appropriations Committee, Banking Committee, Education Committee and Bill Screening Committee. Bill considers himself a transformed New Englander. As part of a job relocation, he moved from Staten Island, NY to Connecticut in 1987 and now embraces the New England ethics and morality our Founding Fathers brought to Plymouth Rock. He graduated from St. Francis College on June 6, 1970 with a BA in English. His plans to pursue a Masters degree in Education did not materialize because on June 7 of the same year, an induction notice from the National Guard called him to report for duty. After six months of basic and OJT at Fort Knox Kentucky he visited old friends, including his part time college employer, The Hartford. Due to a glut of teachers who were getting deferments from military service, Bill had to rethink a career in teaching and thus accepted an offer of employment with The Hartford as a Claim Representative Trainee in April of 1971. With a year of employment under his belt, Bill married his high school sweetheart, Marie. They were blessed with two sons, Bradford and Clifford. Over the years, Bill moved up through increasingly responsible positions at work, leaving the NY Claims office as Assistant Manager, to become a Senior Claim Supervisor in Hartford’s Home Office in 1987. While Bill was still employed with The Hartford in P&C Claims, his career choice of teaching had been realized and became a Training Consultant in 1996. Before long, in addition to school and sports activities, Bill found himself involved with the Republican Town Committee, Inlands and Wetlands Commission and eventually the Board of Selectmen (BOS). During an 11 year tenure on the BOS, he served as First Selectman for 8 of those years. He has been as Justice of the Peace since 2001 and was elected as Town Moderator in 2009. Volunteer activities haven’t been limited to school, sports or public service. Bill also is very involved with several ministries at Trinity Episcopal Church in Tarriffville. He has been involved as a Sunday school teacher, Youth Group Leader and in a leadership position on many Emmaus, teen focused, weekends. He served on the church’s Vestry and as Assistant Treasurer. Bill is part of the Contemporary Worship Team and can be found playing his guitar at the 9:00 am Sunday service. He also served on a Kairos Prison Ministry weekend and now attends monthly reunions with the residents of Osborne Correctional Institution in Somers. Of several mission trips, his fondest memories are from the trip to New Orleans where a team from Trinity helped with gutting a house that had been devastated by Hurricane Katrina. Of course, Bill isn’t all work and no play. He is a NAUI Certified scuba diver, 5th degree black belt in Nanzen Kai Karate and a 4 time finisher of the NYC Marathon (best finish 3:49:53). Now, as his body reminds him it’s getting a little older, he enjoys kayaking on the Farmington River, bicycling on the Rails to Trails bike path, gardening in the yard and playing the guitar anywhere he can.